"This fruity and spicy salsa is yummy on just about everything from chips to barbequed chicken, tacos, and even tofu! By the way, pineapple mojitos are a great accompaniment!" 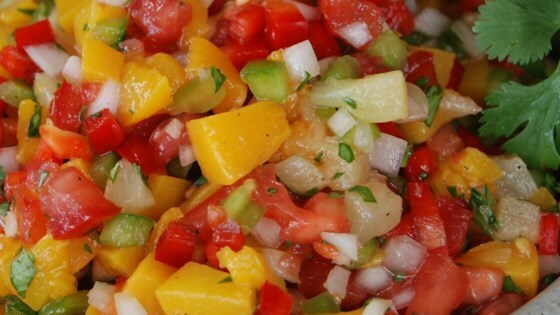 Place the mango, peach, pineapple, tomato, onion, red pepper, yellow pepper, and cilantro in a mixing bowl. Stir in the garlic, jalapeno, lime juice, salt, sugar, and water. Cover and refrigerate at least 1 hour before serving. I use a food processor to prepare the onion, bell peppers, cilantro and jalapeno. If you use one, be careful not to liquify the veggies. I like it, although I didn't like the cilantro very much. Next time I'll leave it out. Other than that it ws very good. Very good; might add black beans or garbanzo beans next time and a few jalapeno...but very good flavor! Tested no co-workers and they loved it! DELICIOUS! I made this for a bridal shower and all the guests loved it. We are sending a copy in the thank you notes :) All I added was a little hot sauce to spice it up a bit. Wonderful salsa! I did take others advice and halved the amount of cilantro and I also only used about 1/2 cup of water because the mangos were very juicy. A lot of chopping but totally worth it!